Analysis: Hood was a long shot to make the 53-man roster this past summer, but the Panthers kept him on injured reserve after he suffered a torn ACL in the preseason finale. The timing of Hood's injury should allow him to be ready for the start of training camp, where he'll once again face a difficult path to make the team. The 230-pound bruiser was selected by Oakland in the seventh round of the 2017 draft and spent most of his rookie season on the Raiders' practice squad. Analysis: Hood was originally selected by the Raiders in the 7th round of last year's draft, but he spent majority of his rookie season on the team's practice squad and was waived by Oakland on Monday. The Panthers are pretty secure with their depth at running back, especially considering they signed veteran tailback C.J. Anderson on Monday, so he could be in line for another year on a practice squad. Analysis: A seventh-round pick of the Raiders in 2017, Hood ended up seeing action in just one game as a rookie, as he spent the bulk of the season as a practice squad player. Hood was always considered a long shot to make Oakland's roster ahead of the upcoming season and the fact that he's being released so early in the offseason doesn't bode well for his chances of making a roster elsewhere. 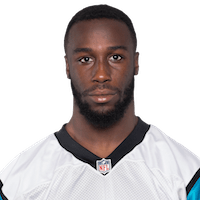 There are no videos available for Elijah Hood. Click here to view all videos.